Divorces in Texas can sometimes put businesses in jeopardy. Community Property is any property that was acquired during the marriage, except for gifts and inheritances, or property designated through prenuptial or postnuptial agreement to be separate property. 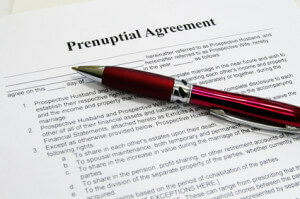 A Prenuptial Agreement is an agreement between prospective spouses, that designates property, including certain income from that property to be separate property in certain circumstances. A Postnuptial Agreement, also called a Partition and Exchange Agreement , is an agreement between two married spouses that creates a similar effect as the Prenuptial Agreement. They each will be enforced so long as they are not unconscionable, were executed voluntarily, and each spouse provided complete disclosure of his or her assets or signed a waiver of disclosure or had adequate knowledge of the other spouse’s property and debts. A divorce does not automatically ensure that separate property will be recognized or that community property will be divided 50/50 because all property owned at the time of divorce is presumed to be community property unless proven not to be through clear and convincing evidence and tracing of assets. Also, the court in Texas makes what is called a just and right division of the community property. That means the court can make a disproportionate division of the community estate, depending on factors concerning fault in the break-up of the marriage. The way you have your business set up also factors into how a business may be affected in a Texas divorce. A CPA or other asset protection professional should be consulted regarding how assets are held under different models of business organizations in Texas. For example, The Texas Business Organizations Code is composed of laws relating to how assets are held and how other owners and shareholders come into play relating to the division or distribution of assets. Also, when one has the correct legal structure for a business, a competitive but reasonable salary may be considered the community income, as opposed to the entire business and its assets, in some circumstances that are appropriately planned for. A company vehicle that is leased by the business, equipment owned by the business, and collections for a business may be protected from divorce distribution if appropriately planned for in some circumstances. If a business was started or acquired during a marriage and no prenuptial or postnuptial agreement was made, one’s share or ownership interest in that business may be divided by the court or a settlement agreement may be made so that other property may be sacrificed in order to keep the business from being damaged. Should one not be able to resolve these issues, a divorced former spouse may be able to make decisions and or sell off business assets, which can cripple the earning power and cause a long fall in which recovery may be difficult.